A couple weeks ago, I met Doris and Amaryllis from Mulu and they surprised me with the best SXSW pitch I’ve ever heard – in a decade of Southbys, I’ve heard them all. The pitch worked mostly cause it took place in the corner of a seedy club somewhere, with cheap beer, and they genuinely believe in doing good in the world with the web. It was as if they’d read all my recent posts about the web. Weird, I know. In these times of “gonna get mine online,” it’s like they’re doing what I’m doing with the bike, but with all sorts of products and connecting people. As I wrote last week, Bike Hugger is on various social channels and now that includes Mulu. Next month I’m riding with Mulu in Palo Alto and will blog more about their staff and what they’re doing. 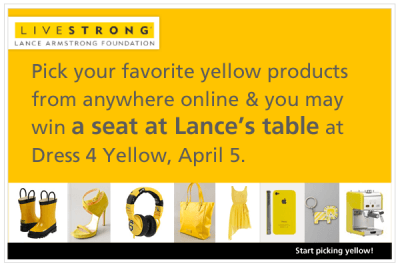 For now, you can start picking yellow and you may win a seat at Lance’s table during the Dress 4 Yellow event on April 5th.